Temperatures are important to enthusiasts and gamers, so we took a bit of time and did some temperature testing on the the ASUS version of the NVIDIA GeForce GTX 960 video card. 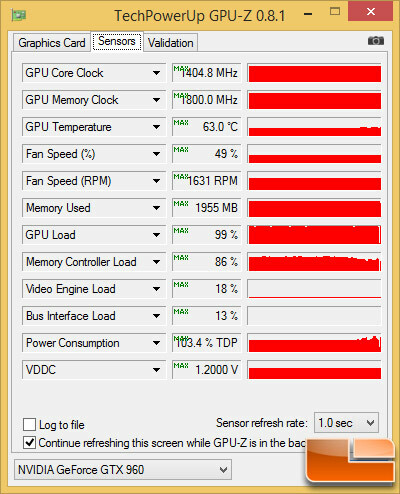 The ASUS Strix GTX 960 DirectCU II video card has no fans spinning at idle, so the card is dead silent. Even with no fans spinning at all we found a rather impressive idle temperature of just 45C. When gaming we hit 63C in a room where the temperature was 67F (20.5C), so we have no complaints at all. 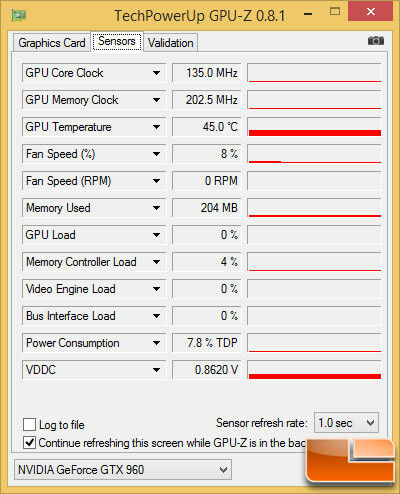 As you can see when we were gaming the GM206 Maxwell GPU was running at 1404.8MHz as you can see above. We test noise levels with an Extech sound level meter that has ±1.5dB accuracy that meets Type 2 standards. This meter ranges from 35dB to 90dB on the low measurement range, which is perfect for us as our test room usually averages around 36dB. We measure the sound level two inches above the corner of the motherboard with ‘A’ frequency weighting. The microphone wind cover is used to make sure no wind is blowing across the microphone, which would seriously throw off the data. 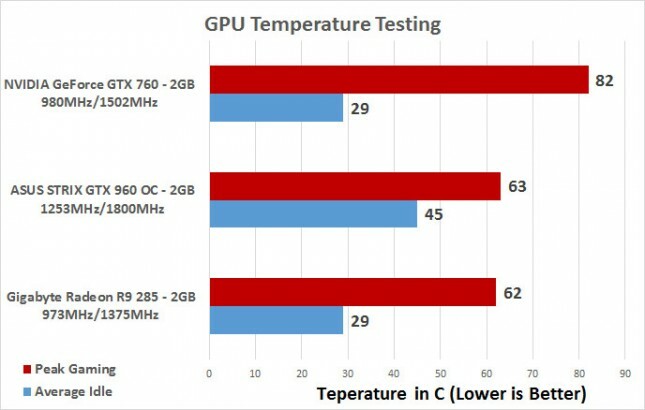 The ASUS STRIX GTX 960 DirectCU II OC 2GB video card has no fans running, so the card is dead silent. The only reason the system is above ambient noise levels is due to water cooler fans and pump noise. 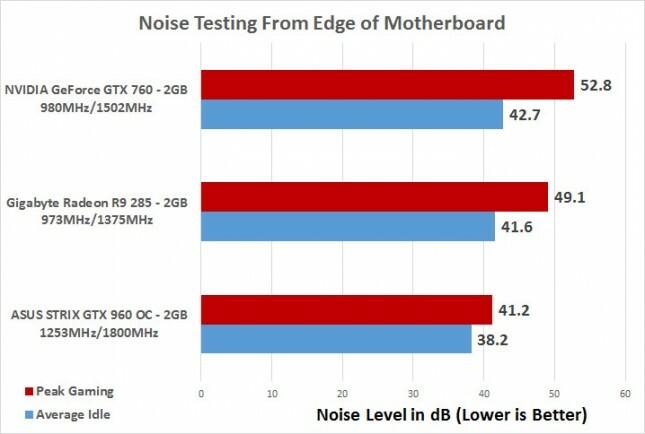 Even with the fans running the ASUS STRIX GTX 960 hit just 41.2dB, so this is a very quiet card and that will appeal to many gamers. We didn’t notice any choke noise when gaming, but we did notice a little bit when we were loading up Far Cry 4. When the opening credits are showing the video card is putting out over 2,000 FPS according to FRAPS and you’ll hear the chokes a bit. Once the game starts and the GPU is loaded up normally there is no choke noise to be heard from the card on our open air test bench. Placing this card inside a case will only improve noise levels (granted it isn’t overheating), so the thermals and noise levels from this card are damn impressive.